The 2017 Summer Undergraduate Research Program class. 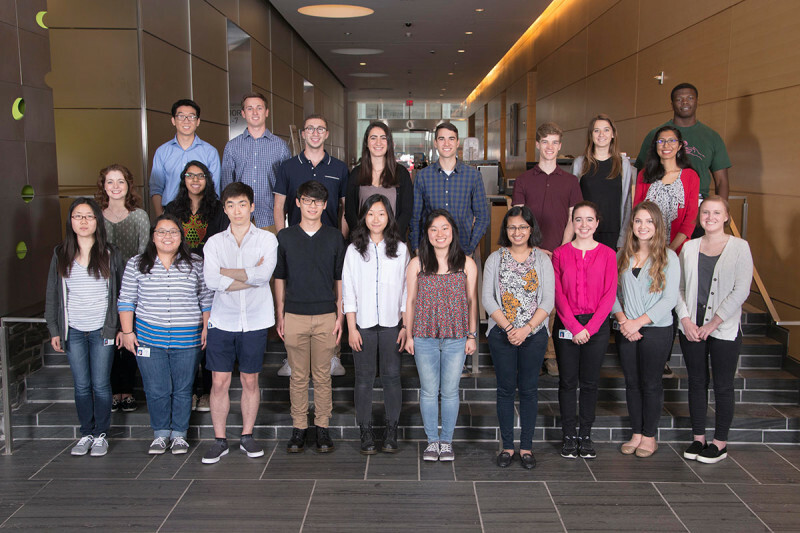 The 2017 Summer Undergraduate Research Program (SURP) began with the arrival of 21 undergraduate students, under the auspices of the Gerstner Sloan Kettering Graduate School of Biomedical Sciences (GSK). GSK Associate Dean Linda Burnley and Dr. Overholtzer welcomed students at orientation. They then had lunch with their “Big Sibs,” who play a role as graduate student mentors, and were introduced to their lab mentors and summer projects. SURP provides students with an array of interactive experiences to help develop interview and presentation skills. The students attend weekly scientific seminars, held this year by researchers Richard White, Stephen Long, Christina Leslie, Joao Xavier, Lydia Finley, Ross Levine, Morgan Huse, Kenneth Marians, Anna-Katerina Hadjantonakis, and Daniel Heller. They also participate in GSK-student-led journal clubs — an activity formed by GSK students themselves. SURP students also participate in individual works-in-progress chalk talks, led by Dr. Overholtzer, who explained at orientation how important it is to be able to communicate and talk about science, which the chalk talks help to facilitate. Every summer, MSK welcomes students in high school, college, and medical school to attend a series of special seminars on cancer-related topics. The program — hosted by the Tri-Institutional Research Program, which includes MSK, Weill Cornell, and Rockefeller University, and coordinated by MSK’s President’s Office — is also open to SURP students. Not only do SURP students interact with the MSK community, they are provided an opportunity to explore New York City as well. This year, students will attend group dinners, a trip to the Bronx Zoo, an ice cream social, and an evening harbor cruise.